A computer generated model of Windsor. Photo: Windsor Link Railway. A consortium including global investor Meridiam has submitted a market-led proposal to the UK government to build the Windsor Link Railway. 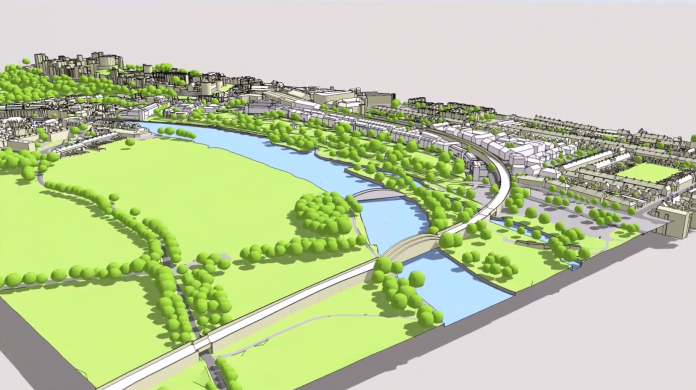 Phase 1 of the project will cost £370 million and will see a new rail tunnel constructed in Windsor – as well as new houses – to connect the South Western and Great Western main lines. Phase 2 will connect Heathrow to the west. The consortium includes a not-for-profit company also called the Windsor Link Railway, which is led by managing director George Bathurst. Other partners have not been revealed. Transport secretary Chris Grayling invited third parties to come forward with ideas to deliver a new southern rail link to Heathrow airport in March as part of a wider call for private investors in the country’s railways. Proposals for both phases was submitted to the government on July 31. If the scheme receives the necessary government approval, Meridiam will finance its equity element of the scheme through to completion, according to the Windsor Link Railway.